The scene at December 10 DA-DO-SF 5 at the legendary Specs Bar in San Francisco’s North Beach neighborhood. When adversity hits, art hits back harder. 2017 was a year marked by political upheaval, rollercoaster emotions, and a strenghthening of bonds in the literary and artistic community. For Three Rooms Press, 2017 was full of challenges, countered by some unbelievably wonderful accomplishments that reminded us of why we are driven to continue to publish books that add to the world of ideas. We published our first hardcover book by renowned NY Times bestselling author William Least Heat-Moon; we hosted a spectacular launch of Phil Marcade’s memoir PUNK AVENUE, drawing more than 500 people and proving that punk rock never died; we earned extensive national publicity for THE OBAMA INHERITANCE: Fifteen Stories of Conspiracy Noir, edited by Gary Phillips, with rave reviews on NPR’s Fresh Air, The Washington Post, Newsweek, and Chicago Tribune. Here’s a play-by-play of some of the most exciting moments throughout 2017. 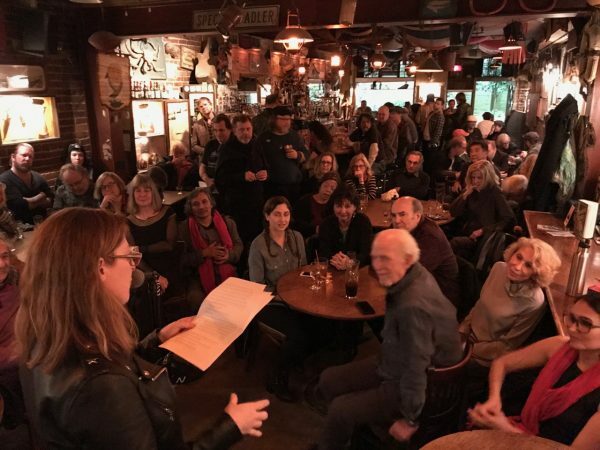 January 13: Hosted 10th Annual Charles Bukowski Memorial Reading at Cornelia Street Cafe with special guests Neeli Cherkovski, Puma Perl, Michael Puzzo, and Richard Vetere. Legenunk provocateur and feminist Alice Bag performing at 3 Rebel Women, hosted by Three Rooms Press January 23 at Le Poisson Rouge. 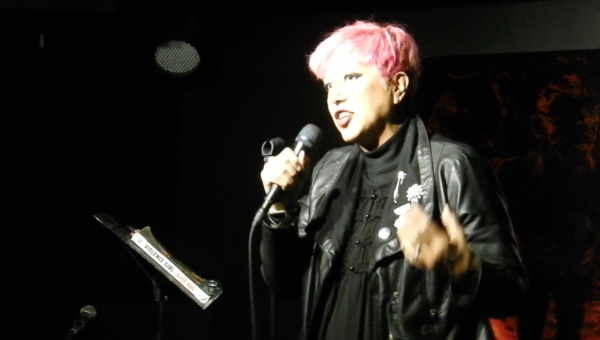 January 23: Hosted An Evening with Three Legendary Rebel Women in The Gallery at Le Poisson Rouge: performance artist and writer Bibbe Hansen, essayist, academic and The Go-Go’s original bass player Margot Olivarria, and singer/songwriter and author Alice Bag. February 3: Presented The Art of The Dead, readings, spoken word and music about Death, hosted by renowned artist and author Heide Hatry, and featuring spoken word by Jane LeCroy, Jennifer Elster, Thomas Fucaloro, plus readings from Icons in Ash by Anthony Haden-Guest, Eleanor Heartney, Claudia Stenberg, and Linda Weintraub. March 3: Hosted RAD/CHIX: A Night with 3 Creative Supstars Bringing Women’s History Month to Life featuring performances by artist/author Bibbe Hansen, writer/performance artist Beth Lisick, and beloved performance poet Anne Waldman with Devin Brahja Waldman on sax. April saw the release of critcally-acclaimed CELESTIAL MECHANICS, the debut novel of NY Times bestselling author William Least Heat-Moon. April 10: Publication of 3RP’s first hardcover book, CELESTIAL MECHANICS, a novel by revered New York Times bestselling author William Least Heat-Moon (Blue Highways, PrairyErth). Heat-Moon’s early work was a strong influence in our development as authors and publishers, and we were extraordinarily honored to have the opportunity to publish his debut novel, which Midwest Book Review calls “An erudite, sophisticated, inherently engaging, and unfailingly entertaining read from beginning to end.” To celebrate the book launch, we traveled to Heat-Moon’s hometown of Columbia, MO, ate at famed Boochie’s! The launch event at St. Louis Public Library – Scholarly Branch, co-hosted by Left Bank Books, featured Heat-Moon delivering a fascinating presentation about the common thread between all members of humanity, and the need to understand human life intellectually and emotionally, bridging divides currently plaguing the country. Related events: May 2: William Least Heat-Moon book launch at Flat Branch Pub. In his hometown of Columbia, MO, the renowned author turned a book signing event into a fundraiser, offering signed original printouts of early versions of his manuscript to raise money for University of Missouri Libraries’ Special Collections. May 4: An Evening with William Least Heat-Moon at Kansas City Public Library. 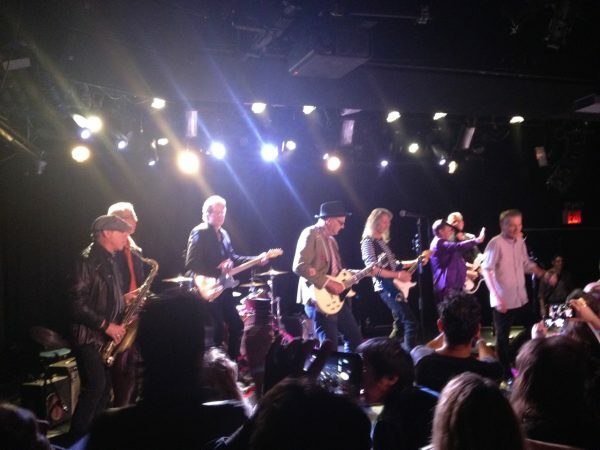 May 2 PUNK AVENUE launch at Le Poisson Rouge with a stage full of punk legends including author Phil Marcade, Lenny Kaye (Patti Smith Group), Walter Lure (The Heartbrekers), and more. Related events: May 11: Book signing with author Phil Marcade at Lower East Side punk leather store The Cast. 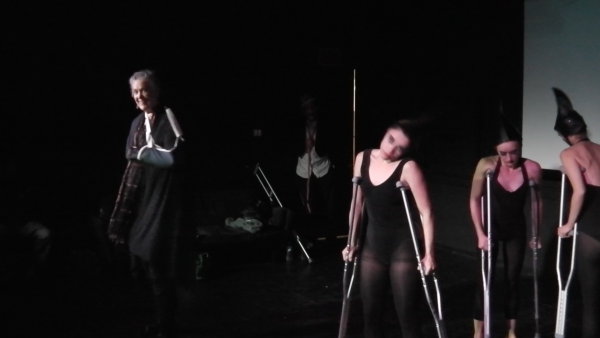 Still from performance piece by Linda Albertano at LA di DADA 5 at Beyond Baroque, June 10. July 30: An afternoon of Contemporary Gothic Poetry celebrating the birthday of Emily Brontë at The Parkside Lounge, NYC. Goth poetry has seen a surge in recent years, and TRP celebrated with readings by TRP editor Constance Renfrow, Things to Do When You’re Goth In the Country author Chavisa Woods, and critically-acclaimed essayist (and Goth!) Deidre Coyle. Annual writers’ retreat, Biddeford, Maine. This year included visits by Swing State author Michael T. Fournier, mystery novelist and OBAMA INHERITANCE contributor Kate Flora, and world-renowned sarod player and ethnomusicologist George Ruckert and legendary Kathak dance pioneer Gretchen Hayden Ruckert. Poet and MAINTENANT contributor Iulia Milataru from Bucharest, Romania, performing at Entrez Dada Paris at La Cave Cafe, September 4. Dada Europe Tour. September 2: Dada London Invasion at The Horse Hospital, London, UK. September 4: 2017 Entrez Dada!, La Cave Cafe, Paris, France. September 8-11: 5th Annual Brussels Poetry Fest featuring dada performances at Brussels Planetarium, Magritte House, and BelVue Museum. 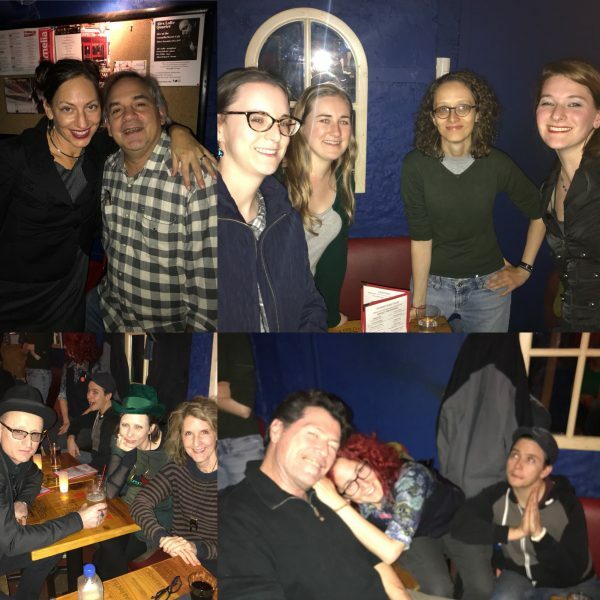 This year’s European tour brought dada to packed houses in London, Paris, and Brussels, with brilliant poetry and performance art of contributors to MAINTENANT Dada Journal from numerous countries in Western and Eastern Europe. October 12: Heartland Fall Forum, Chicago. 3RP co-directors Peter Carlaftes and Kat Georges joined William Least Heat-Moon to present an excerpt from CELESTIAL MECHANICS before a gather of 250 Midwest booksellers and librarians. Book launch for THE OBAMA INHERITANCE at Eso Won Books in Los Angeles. October 24: Book Launch for THE OBAMA INHERITANCE: Fifteen Stories of Conspiracy Noir at Eso-Won Bookshop, Los Angeles, CA. 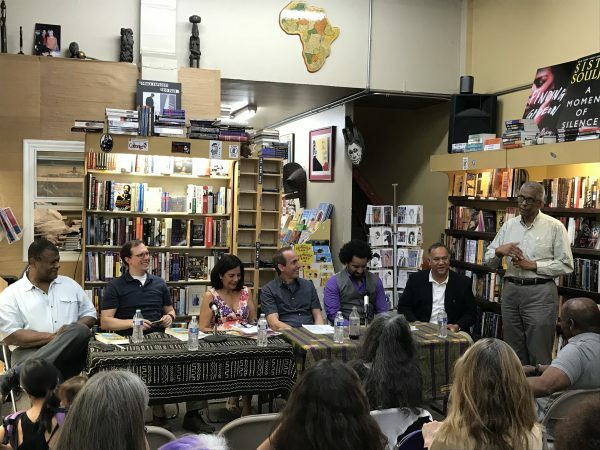 At one of the most prestigious African-American focused bookstores in the U.S., 3RP presented editor Gary Phillips, plus contributors Christopher Chambers, Désirée Zamorano, Danny Gardner, Eric Beetner, and Travis Richardson. THE OBAMA INHERITANCE has been a runaway success with rave reviews on NPR-Fresh Air (“Stories so sly, fresh and Bizarro World witty, they reaffirm the resiliency of the artistic imagination.”), The Washington Post (“Conspiracy theories about Obama spun out to their wackiest sci-fi conclusions … Resistance takes many forms, particularly in the current political climate. Few methods of protest are as cheerfully strange and purposefully bizarre as THE OBAMA INHERITANCE.”), Newsweek (“Top 15 Recommended Fall Titles” and “Top Seven New Books to Make You Happy You Can Read”), and Chicago Tribune (“Truth may be stranger than fiction, but why should the conspiracists have all the fun of creating fake narratives?”). November 2: A Night of Strange Noir at Antioch University, Los Angeles, CA; featuring editor Gary Phillips with Désirée Zamorano, Danny Gardner, Eric Beetner, and Travis Richardson. November 2: Reading at Third Place Books, Seattle, WA; featuring contributor Nisi Shawl. November 3: Reading and Discussion at East City Bookshop, Washington, D.C.; featuring contributor Christopher Chambers, 3RP co-directors Peter Carlaftes and Kat Georges plus moderator author Lou Bayard. November 10: National Press Club Annual Book Fair, Washington, DC, feat. contributor Christopher Chambers. December 11: Reading and Signing by contributor Christopher Chambers at Buxton’s Books, Charleston, SC. December 31: Bibliocracy Radio show, Los Angeles, CA, featuring editor Gary Phillips, plus contributor Désirée Zamorano with host Andrew Tonkovich. October 20: Bronx Power Poets at Cornelia Street Cafe, NYC. An evening of poetry by three emerging poets from The Bronx, including Rebecca Y.S. Perez, Melodic, and Joel Gonzalez. A great chance to hear new voices in a rare Manhattan setting. December 1: Prose! Poetry! Party! 5! Our annual NYC holiday party featuring Three Rooms Press authors. This year’s event included performances by Meagan Brothers, Kofi Forson, Adam Lance Garcia, Robert Gibbons, Aimee Herman, Karen Hildebrand, David Lawton, Jane LeCroy, Jane Ormerod, John S. Paul, Rebecca Y.S. Perez, and Constance Renfrow, plus poetry from hosts Kat Georges and Peter Carlaftes. December 10: Da-Do-SF at Specs 5. Our annual San Francisco’s legendary Specs Twelve Adler Museum Cafe was a wonder this year, with a stellar line-up of poets and performance artists including Jack Hirschman, Neeli Cherkovski, Maw Shein Win, Galadrielle Allman, Marc Olmsted, Suzi Kaplan Olmsted, Thomas Stolmar, Lorene Zouzounis, Carol Dorf, Richard Stone, Mara Patricia Hernandez, Robert Duncan, and Josey Rose Duncan. Thanks to all the fine authors and contributors for making this year so special. And huge thanks to all readers and supporters of Three Rooms Press, without whom, we’d be nowhere. We vow to continue to contribute ideas and stories of value to the world, and seek out work that will be meaningful—and enjoyable! Happy New Year!